Oscar Wilde supposedly said that a well-tied tie is the first serious step in life. The team of the Gentleman’s Digest is not entirely sure whether we should go that far… Mr. Wilde, however, had a valid point, although we would slightly alter the message. It’s less the well-tied tie than the badly-tied one that makes or breaks your entire attire. A perfectly tied necktie will smoothly bring everything together and add a nice finishing touch to your dress. A poorly tied tie on the other hand will stand out and has the potential to ruin it all for you, even if you went all out and perfectly orchestrated all other parts of your dress. With its simplicity, it is best suited for heavier fabrics, simply because of the overall knot size. No matter what fabric your tie is made of, a four-in-hand will result in a narrow, smaller knot. Tying a four-in-hand into a delicate silk tie (e.g. Hermes), for example, will result in a pretty puny knot. Also, the four-in-hand is one of the asymmetric knots which always seem to be slightly more casual. 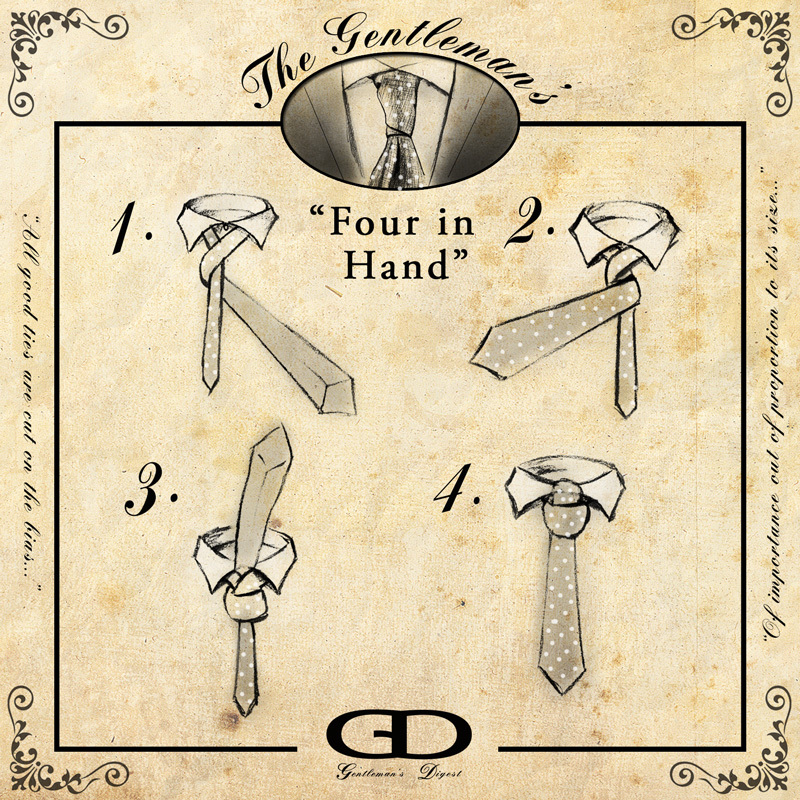 Four-in-hands, because of the shape, are best worn by men with shorter necks, elongating the perceived height of the neck. On a similar note, four-in-hand knots are probably your best bet for a narrower collar (e.g. point collar), simply because the size of the knot. But don’t get us wrong: The four-in-hand is a great knot for various collar types, as our picture shows. Our examples here have been provided by our friends at T.M. Lewin. From the Gentleman’s left, cross the longer and wider end of the tie over the narrow to his right. Wrap around the back fully, emerging again on the Gentleman’s right. Take the wide end up behind the knot and up through the collar toward one’s nose. Insert the same end down through the knot and cinch snuggly. Feel free to save this diagram for later! 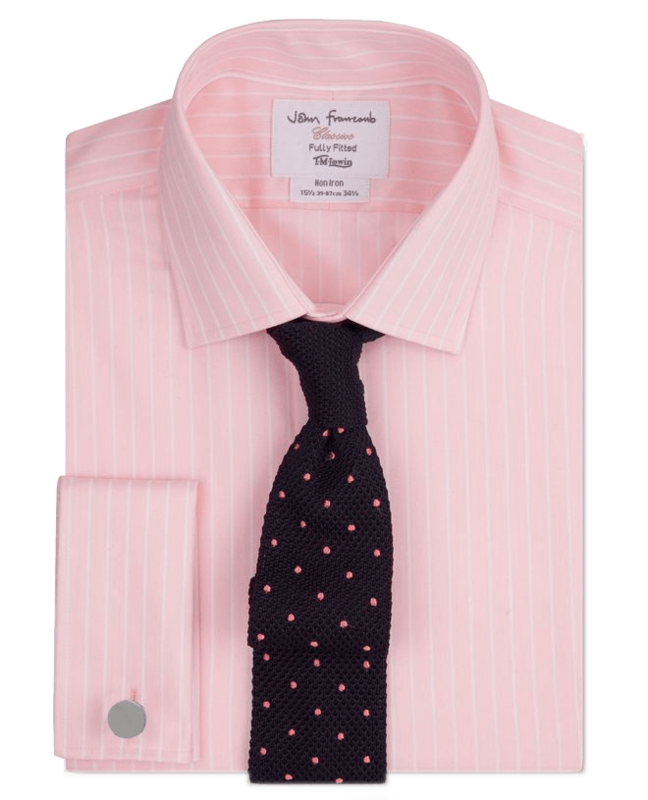 If you want to learn more about the different collar types or browse a great selection of classic dress shirts, we recommend a short visit to our London based friends’ stores or website. Mr. Thomas Mayes Lewin established his Jermyn Street store in 1898 and very much embodies many qualities the Gentleman’s Digest appreciates: timeless menswear based on craftsmanship, quality, and service. Today, T.M. 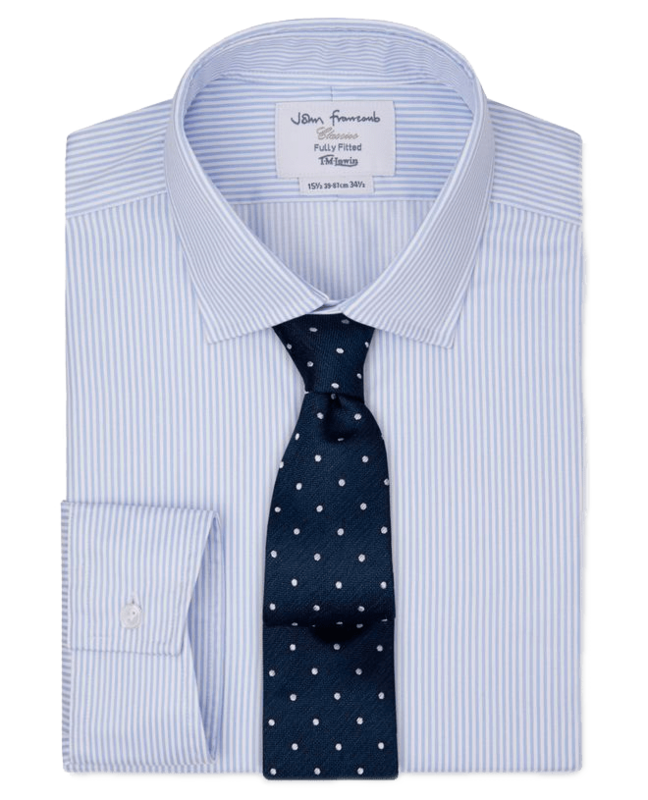 Lewin has stores all over the world and their extensive collection online lets you see the different collar types. Check out their online store at www.tmlewin.com and choose your country.